The famously cold winter of 2014 did have a least one advantage: thoroughly frozen bays on Lake Superior in and around Thunder Bay. After many bitterly cold days spent indoors with our four-year-old (let’s just say we completed an entire papier mâché solar system for her bedroom ceiling) we woke up one Saturday morning in late winter to discover perfect conditions: mild temperatures, a gentle breeze and endless blue skies. It was time to get out of the house at last. 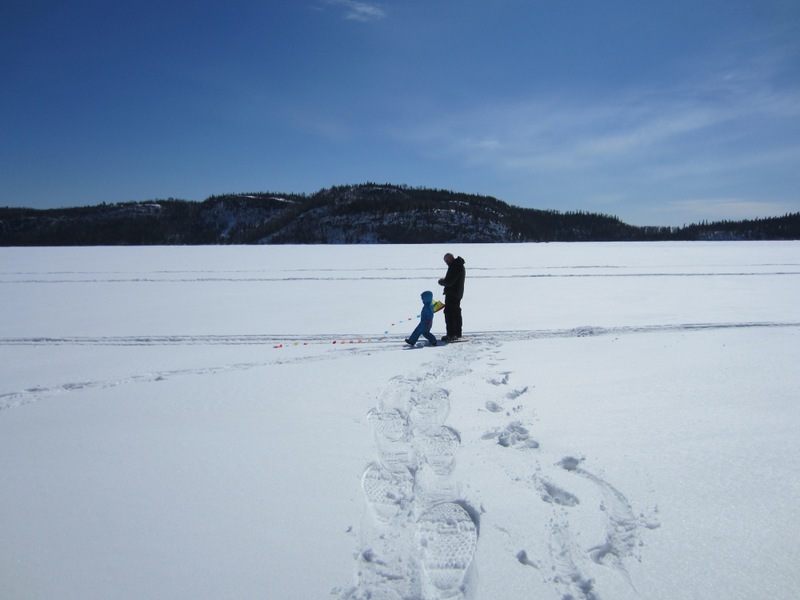 We decided to head to Little Trout Bay Conservation Area, about a 30-minute drive south on Highway 61 from our home in Thunder Bay. 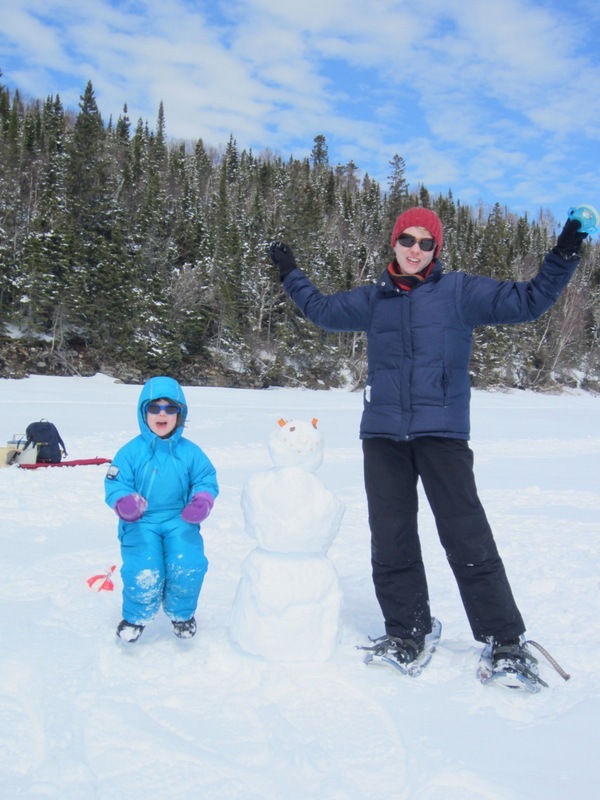 Managed by the Lakehead Region Conservation Authority, Little Trout is easy to get to even in the winter and offers a large ploughed parking lot. 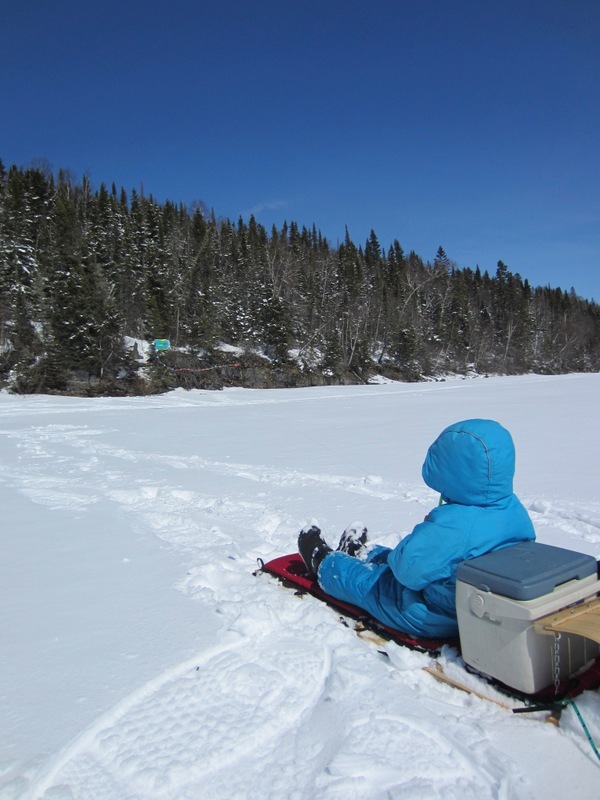 We had been there often in the summer and fall to launch our canoe at the public boat launch, have lunch at the picnic tables and watch bigger boats head out to catch Lake Superior salmon, pickerel, whitefish, rainbow trout and lake trout. There are also two trails, a one-km in-and-out called the Lookout that offers panoramic views of the boreal forest and Cloud Bay, and the 1.2 km Lakeside Trail which loops through the boreal forest with glimpses of Superior. This time, however, we headed for the bay, which was covered in ice at least a metre thick, topped with windswept, hard-packed pure white snow. Combined with the brilliant sunshine and the rugged rocky shore fringed with jack pine and white pine, it was an unforgettable landscape. After jumping around on the boulders on the breakwater by the boat launch, we started walking northeast on the ice, following snowmobile tracks along the shoreline. The adults were wearing snowshoes but they weren’t really necessary, and our wooden toboggan with our mini-cooler of lunch and snacks bungy-corded to it scooted along easily. 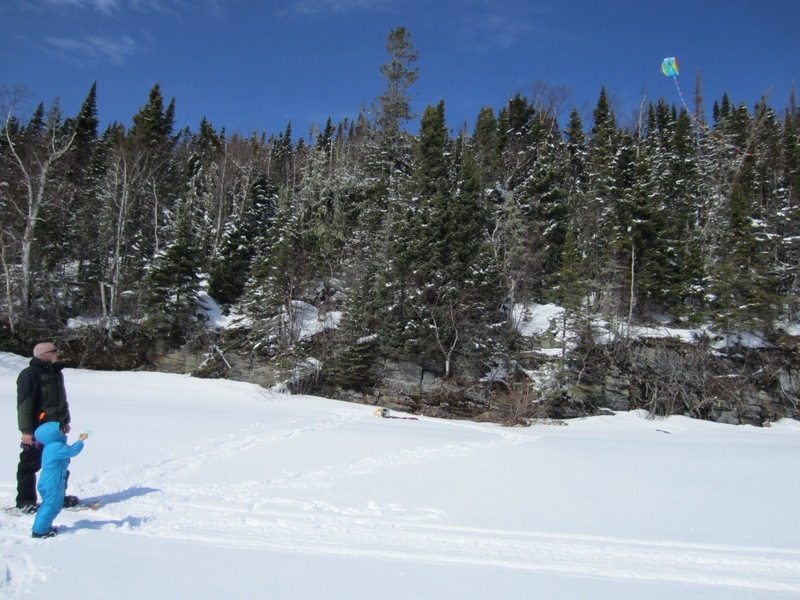 Occasionally we’d detour towards the sun-warmed rocks on the shoreline to investigate an interesting snowdrift, a friendly gray jay or a variety of wildlife footprints, mostly red squirrels and ruffed grouse. We also made a snowman monster, decorated with snack leftovers. Since the breeze was steady and not too cold, we pulled out our pocket kite (a $12 investment that packs down into a small nylon pouch). Soon it was dipping, swooping and sailing against the bright blue sky. 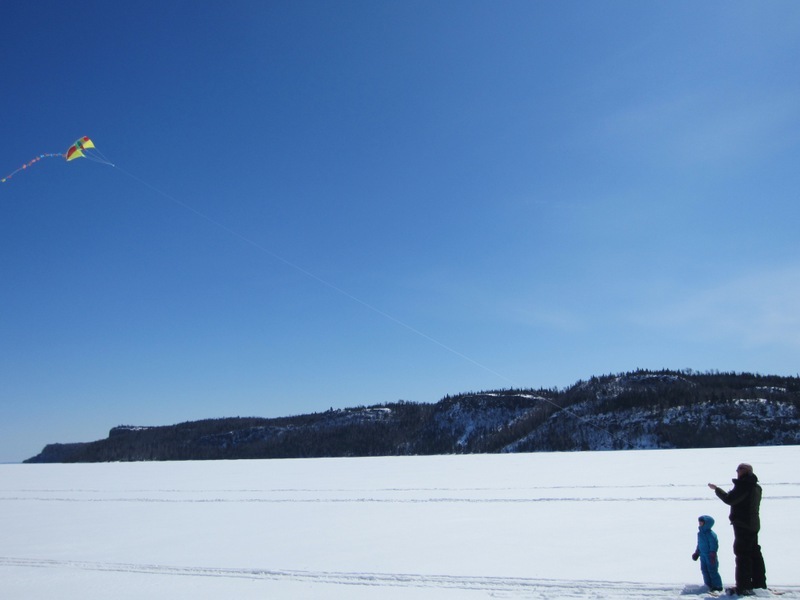 The kite is small enough for my preschooler to handle, and when she was tired of walking she plunked down on the toboggan, kite still in hand, and watched it dance in the sky all the way back to the landing. 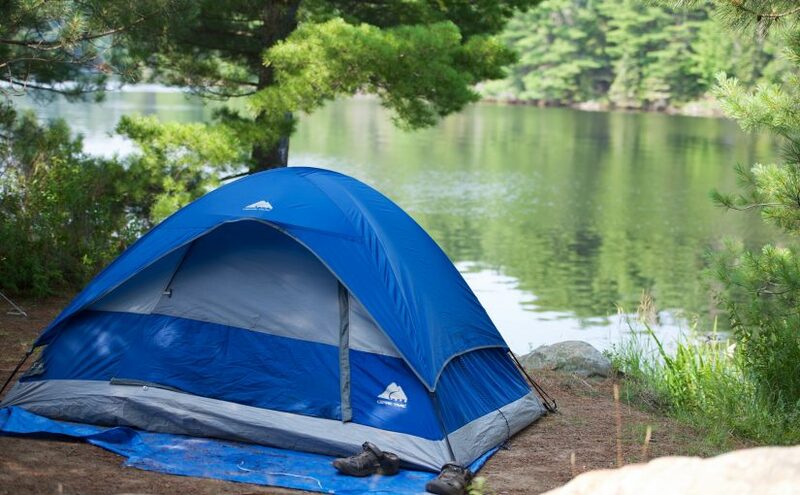 Little Trout Bay Conservation Area is located 45 minutes south of Thunder Bay in the Municipality of Neebing. Take Highway 61 south to Little Trout Bay Road and turn left at the gas station. Follow the road seven minutes to the Conservation Area. Parking is $2, on the honour system, or you can purchase an Explore Parking Pass for $30 through the LRCA office that gives you unlimited day parking at the 11 conservation areas in the Thunder Bay area. Remember to exercise caution and common sense on frozen bodies of water. According to the Canadian Red Cross, ice should be at least 20 cm thick for a group outing. Check with local authorities before venturing out onto public waterways.